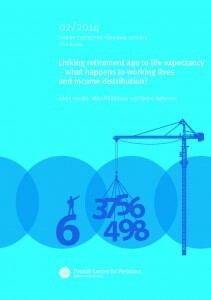 Linking retirement age to life expectancy – what happens to working lives and income distribution? This study investigates the impact that pension policy measures aiming to extend working lives have on working lives, retirement ages and income distribution, as well as on the fiscal sustainability of the earnings-related pension system and public finances. Our research report is divided into four articles, each addressing various research questions. The first article focuses on the impact of pension reforms on working lives and income distribution. The second article ponders ways in which to link the earliest pensionable age to life expectancy, while the third looks at how this linking affects the size and financing of pensions and the fiscal sustainability of overall public finances. The articles are linked, so that the third utilizes the results of the first two. In the last article, the described reform is compared to reforms in the other Nordic countries and the reform proposals featured there. Next we will present the most important results and conclusions from each article.